See if I'm in your town! Next week I return to one of my favorite areas of the country, the Pacific Northwest. I'm headlining a bunch of gigs. My tour schedule is above. I'll be up there for about 2 1/3 weeks. I'm also finally going to meet The Real Kris Shaw. There are 2 comedians named Kris Shaw and I'm going to meet the real one! 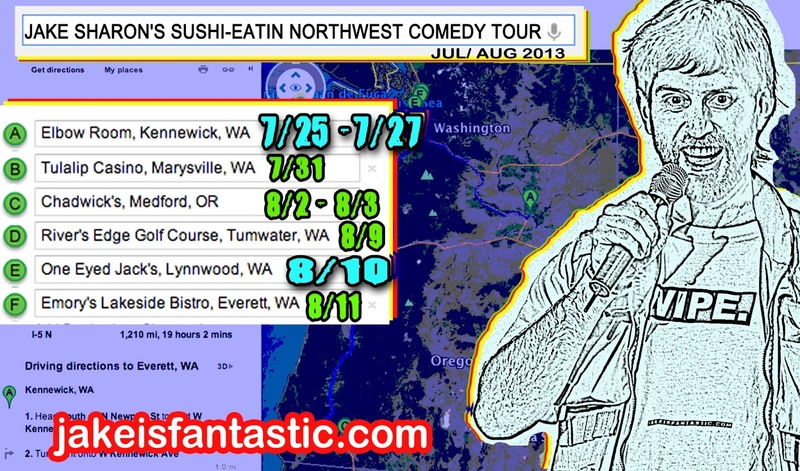 My former Austin roommate, Matt Golightly, is doing a Northwest tour too. So, we're going to watch the Mariners play some baseball. It's going to be a fun trip. UPDATE: JUST ADDED A PORTLAND SHOW! The Flying Spaghetti Monster! He does exist! In America, the Northwest is the place to get it! You don't eat sushi in Texas. You don't eat a steak in Oregon. You don't eat clam chowder in New Mexico. You don't eat Mexican food in Boston. You eat sushi in the Northwest. That's where it's the best. 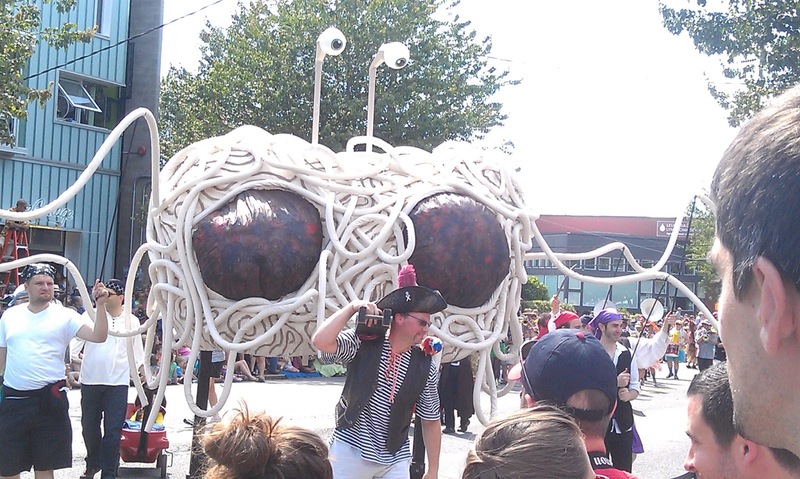 THERE'S ALWAYS SOMETHING WEIRD TO SEE IN SEATTLE. I usually go up there a couple times a year. I usually space my trips about 6 months apart from each other. This time, I am heading up there about a month after my last trip. Last time I was in Seattle was June 21-22. I was headlining my favorite Tacoma comedy club, Grit City Comedy Club. I love that place! I happened to be in the area during the Summer Solstice, too. A couple of my couchsurfing friends and I went to Fremont's annual Summer Solstice Parade. All the "floats" are man-powered. No cars allowed! 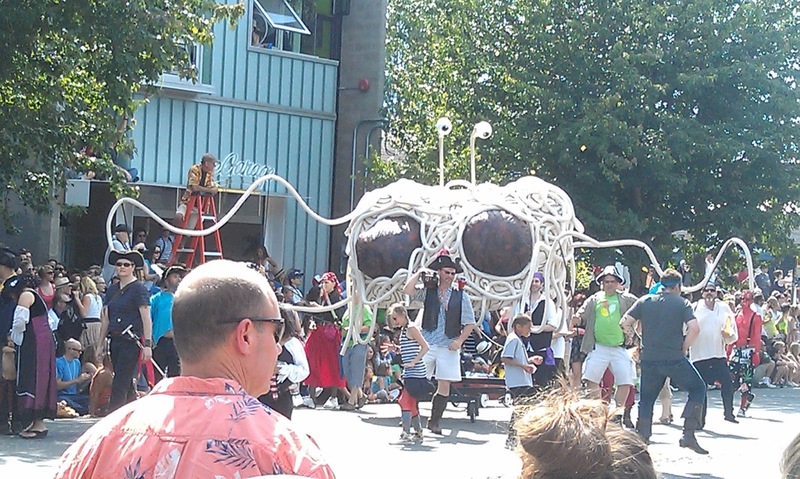 Everything was powered by pedestrians and modified bicycles. The only cars in the parade were the police cars behind the parade, making sure nobody got unruly. 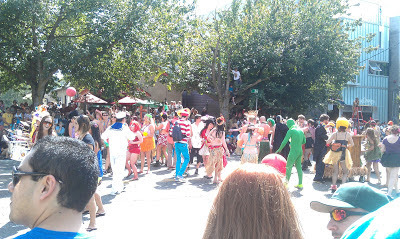 One cool thing is random, unofficial people joined the parade too. They just started walking along with the official parade people. Kids were dancing with the dancers. 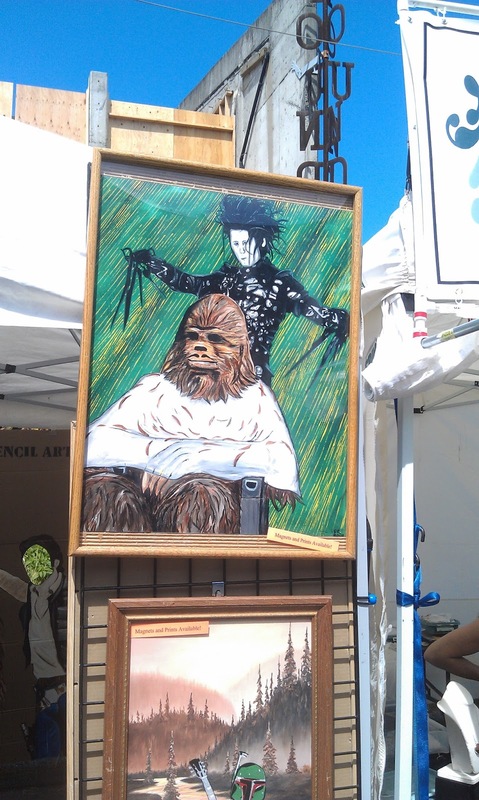 The whole thing was whimsical. Also, there were naked cyclists. I didn't get any pictures of them. Sorry about that guys. I know how much you wanted to see painted balls. Almost bought one of this guy's magnets. I'll be gone awhile this time. I hate leaving my wife behind for that long. I'll miss her a bunch. It used to be whenever I traveled, I didn't care how long I was gone. I was just enjoying the ride. If I'm on the road, I have to be doing gigs, making money- or I have to go home. If I'm not making money, I can do that at home. Austin's a great place to not make money! I don't drive more than 6 hours anymore. Last year, I did four 23-hour drives. Truckers aren't even allowed to drive that long! What am I? A joke trucker? Those drives took their toll on my car and they took their toll on my sanity. Plus, I had to pay actual tolls! Essentially, if the gig isn't within a 6-hour drive, or if it isn't worth flying there, I'm not going. I can find some other gig that does fit within those parameters. 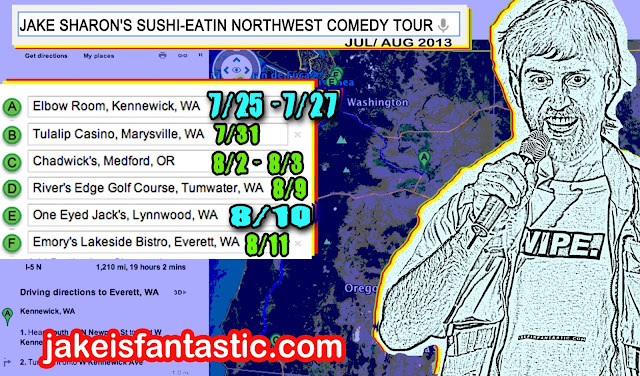 That's the thing about the Northwest: There is a ton of comedy up there, so I can always string a bunch of gigs together. One time, I was up there for 6 weeks doing gigs. I had work the whole time. I didn't even do every gig they had! It certainly helped that I know Susan Jones. She sits there in her captain's chair calling bookers and suddenly I have gigs. Also, Seattle's mass transit is decent. So, I don't have to have a car the whole time. And when I do need a car, I can just rent one. I am going back to a lot of the same gigs I have done before. I am also doing some new ones. I am thrilled to be back up there. 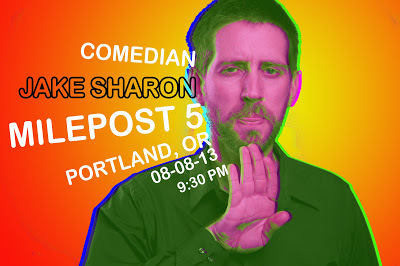 Going to see a bunch of my comedy friends. I might even go into Vancouver! And yes: I am going to eat all the friggin sushi! P.S. Here's an unedited video of me at a sushi place in Federal Way, WA. They have trains! Also, back then I had super long, dirty hair!